Tor Books announced they have released Halo: Ghosts of Onyx paperback to the mass market. Quote from the Tor Press Release: "April 4, 2007 - Tor Books, an imprint of Tom Doherty Associates, LLC—the largest publisher of science fiction in the world—in partnership with Bungie Studios, one of Microsoft Game Studios’ premiere first part game development studios, today announced the mass market release of Halo: Ghosts of Onyx. The first in a three novel series from Tor, Halo: Ghosts of Onyx, was written by Eric Nylund. Nylund authored two of the previous Halo® novels, Halo: The Fall of Reach and Halo: First Strike. Halo: Ghosts of Onyx takes readers deep into crucial events that unfold during the Halo and Halo 2 timelines, expanding the characters and story of the Halo Universe as fans eagerly await the arrival of Halo 3 later this year. 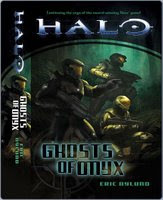 Originally released as a trade paperback in November 2006, Halo: Ghosts of Onyx debuted as a New York Times Bestseller, remaining on the list for 11 straight weeks and going on to become an international bestseller. At least two more novels will follow over the next few years, each exploring the game’s rich universe, characters and mythos." Have you read this book yet? Well, I am a self professed Halo fanboy and I am totally ashamed to say I have not read it yet. I think it may just be time to remedy that situation. If you feel the same way, click the picture of the book to be taken to Amazon.com and buy yourself a copy.